If you’re a Las Vegas resident, when you owe the bank more than your home is worth (you’re underwater), and need/want to sell it, you’re looking at a Las Vegas short sale. Or, in more simple terms, if your property won’t sell for enough money to pay the bank back every penny you owe them, that’s a short sale. In Las Vegas, about 80% of the homes are underwater, and a majority of all real estate transactions are completed as short sales. Any balance that won’t be paid off by the sale is called a “deficiency”. And the most important part of the short sale is getting a “deficiency waiver”. A deficiency waiver is a document from the bank releasing their claim on any left-over balance. In other words, it’s your guarantee that the bank won’t sue you for the balance of the loan in the future. That’s why you need P and A. What is “Cash for Keys”? You may find this hard to believe, but because of various government programs and bailouts, your bank wants you to short sell your home! To entice homeowners to sell (and get the housing market back-on-track), the banks came up with a system that PAYS homeowners in Las Vegas to short sell their properties. This incentive-payment is called “Cash for Keys” and can be as high as $33,000! If your home is underwater, call Peters and Associates today at 702-818-3888 to schedule your free consultation! Do I Need a Real Estate Agent or an Attorney? Despite what some people say, you need both! There are two parts to every Las Vegas short sale: (1) Listing the property for sale and collecting offers; and (2) Negotiating with the bank to waive the deficiency and get you “Cash for Keys” money. Ideally, the work should be divided so that you have experts handling both sides of your short sale. When you hire Peters and Associates, we make this really easy by getting a top real estate agent for you at no cost. That agent will list the property and collect the offers, and our law firm will handle all negotiations with your bank. This method ensures that your property gets sold as quickly as possible AND that your rights are protected. Click here to call us now and set a free consultation with one of our attorneys! Should I do a Las Vegas Short Sale or Loan Modification? Why not do both? At Peters and Associates, we understand that most homeowners considering a Las Vegas short sale would keep their homes if the bank lowered the amount they owed. That’s why we’ve pioneered the All-in-One Program. We’ve completed hundreds of short sales, but a lot of people come in and want to keep their home. But, they’ve seen all the short sale ads and think that’s the only way out. At P and A, we’re happy to handle your Las Vegas short sale, if that’s what you want to do. But, if you’d rather keep it we’re happy to assist with a loan modification, Short Sale Lease Back (Short Sale and Stay), or if you’re on the fence, our All-in-one program. If you’re on the fence about whether to short sell your home or modify it, click here to learn more. Homeowners in Las Vegas and Henderson, Nevada who are facing foreclosure on a home that is worth less than they owe on the mortgage trust a Las Vegas short sale lawyer at Peters & Associates, LLP to negotiate a Short Sale or a Deed in Lieu that relieves them of their mortgage obligation and any deficiency and helps them back on their feet financially. A Short Sale means that you are selling the house for less than what you owe on the mortgage, but the bank has agreed to accept the proceeds of the sale in satisfaction of the debt. A short sale is a viable option when you are facing the possibility of a foreclosure and it makes financial sense to exit the property. There are a number of ways in which you may find yourself under water or upside down on your mortgage, owing more than your home is worth. The housing market in many areas was overinflated for a number of years, and when this bubble deflated about five years ago, home values plummeted. If you bought your home more than five years ago, you may have bought an over-valued home which is now worth much less than you owe on it. The other factor which occurred in tandem with the drop in the housing market was the sub-prime and adjustable rate mortgage crisis. Many people were able to afford homes only by making loans that they really could not afford, and banks were all too willing to make these loans. Many loans such as ARMs and Option ARMs had adjustable interest rates that reset at much higher rates than the borrower initially encountered. If your mortgage payments have outstripped your ability to pay while the value of your home has gone down, a Short Sale lawyer may be the answer to your troubles. What about a Deed in Lieu? You may have heard about a Deed in Lieu of Foreclosure as a way of walking away from your house. That is basically what it is, but there is a big difference between walking away from your house with no further obligation, and walking away from your house and letting the bank foreclose on the property. With a Deed in Lieu, you turn over the deed to your house to the bank, which now owns the property and releases you from any financial obligation on the mortgage. There is no foreclosure. Short Sales are preferable to Deeds in Lieu, because with the Short Sale you are able to pull out at least some of the equity in your home. A Short Sale, however, is not always possible or practical. In those cases, we can negotiate a Deed in Lieu on your behalf, avoiding foreclosure and helping you to get back into a property that you can afford without the obstacle of a foreclosure on your credit report. Before you walk away from your home and let the bank foreclose on it, consider the options that let you walk away on your own terms, with money in your pocket and without any further liability on your mortgage. 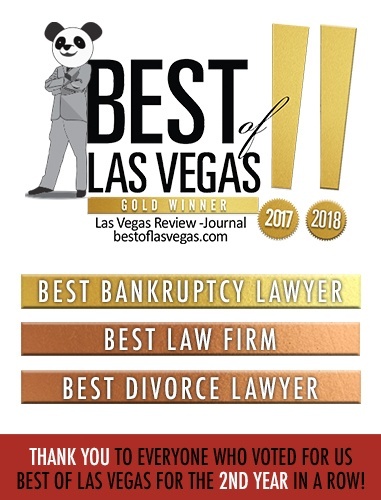 In Las Vegas and Henderson, contact Peters & Associates, LLP for a free consultation regarding whether a Short Sale lawyer or a Deed in Lieu is in your best interests. The All-in-One Program by Peters and Associates! If your modification doesn’t come with a principal reduction, or is rejected outright by the bank, your attorney will use the documentation trail he created during the modification process to PROVE that you’ve negotiated in good faith, and work to FORCE the bank to accept a short sale with a full deficiency waiver. How long does the All-in-One take? Honestly, that’s up to you. Some Peters and Associates clients choose to end their service after the modification is complete. They are happy with their new terms, or new balance, and want to keep their home. However, when the balance isn’t reduced, many P and A clients choose to continue on and complete the short sale. In essence, the program is like a strategic default. While your attorney is negotiating, you may choose not to make mortgage payments. Several clients have been in the program for 20 months or more and some clients have been in the program over 50 months. Imagine: How much cash you could save if you “skipped” 50 mortgage payments and instead, put most of that money in the bank? This is why you’ll often hear people refer to the All-in-One program as a “Wealth Builder”. As an added benefit, any missed payments are wiped out when you get a principal reduction or complete your short sale. If you’re on the fence about modifications and short sales, call Peters and Associates today at 702-818-3888 to schedule your free consultation and learn more about the All-in-One program! Short sale and stay programs (also known as Short Sale/BuyBack or Short Sale to Yourself) are designed to help someone that doesn’t qualify for principal reductions keep their home and lower the amount they owe on the property. In theory, short selling to yourself can sound like a really good idea. Unfortunately, Short Sale and Stay programs are a lot more complicated than they seem on the surface. First off, one of the requirements the banks put into place when authorizing a short sale is called an “arm’s-length agreement”. Several non-attorneys believe that a relatively new law, known as the Nevada Homeowner’s Bill of Rights (NHBR), prohibits arm’s length agreements or declares them invalid. Unfortunately, that’s simply not the case. The NHBR, or SB321, simply states that the State of Nevada doesn’t require such agreements, but makes it clear that it doesn’t prohibit them either. Unsuspecting homeowners may be inadvertently committing federal bank fraud by short selling to themselves. At present, bank fraud carries a maximum penalty of a one million dollar fine and ten years in federal prison. As if that weren’t bad enough, in every short sale and stay program there is a period of time in which you DO NOT own your own home. In reality, you’ve become a renter and all of your “homeowner’s rights” are eliminated. You’re signing your title over to a non-profit or other entity with the hope that you’ll be able to buy it back in the future. Considering that nearly every single fraud-alert warns about signing your title over to any company that’s “promising” to help with your home, do you really think these programs are a good idea? Fortunately, experienced, full-service law firms like Peters and Associates understand that if you want to keep your home, lowering your payment and mortgage balance rarely require you to sign over the title. Please understand, if a short sale buyback is your best option, our attorneys are happy to handle your case, help you navigate the complex paperwork, and protect you from potential future criminal investigations or liability. Q. Why should I hire a Short Sale Attorney instead of just using a real estate agent? A. Real estate agents excel at buying and selling property, but they are not experts in contract law. The reason you are entering using a short sale attorney is not because you want to sell your home; it is because you are either under water with your mortgage or cannot afford the payments and are facing foreclosure. Your main interest is not in selling the home; it is in getting out of the contract and in not being liable for the deficiency. A Short Sale must be negotiated first with the lender before you attempt to sell your home. For these issues you need a short sale attorney; not a real estate agent. Q. Why not just walk away and let the bank foreclose? A. You don’t owe your house to the bank; you owe an amount of money, which is secured by a mortgage on the house. When the bank forecloses, it takes that security – the house – and sells it for what it can to offset the amount you owe on your mortgage. But any deficiency left over remains your responsibility, and the bank can sue you for that deficiency and obtain a money judgment against you. If instead you negotiate a Short Sale, a Deed in Lieu of Foreclosure, or any other transaction such as Cash For Keys, your short sale attorney can probably relieve you of all financial obligations related to the house, including any deficiency. If you negotiate a deal rather than let the bank foreclose, you leave on your terms, rather than being unceremoniously evicted by the sheriff in front of your neighbors. Also, any negotiated settlement will have less of an impact on your credit report than a foreclosure. Following a Short Sale, you may be able to get a new loan in as soon as six months. Getting approved for a new loan after a foreclosure will probably take considerably longer. Contact a short sale attorney experienced in real estate and contract law before you decide to walk away from your home. Using this form does not constitute an attorney-client relationship.